Along the Grand Strand, the peak of the tourist season occurs each year between the last two weeks of July and the first two weeks of August. The Center tracks lodging demand in two different ways. The business performance of the nightly rented hotels, condo-hotels and campsites (HC-HCs) is estimated with the assistance of lodging properties that voluntarily provide their daily performance records to the Center. The business performance of the weekly rented vacation rental properties (VRPs) is estimated by observing the booking status and advertised rental prices on the reservation websites of a scientifically random sample of rental properties. 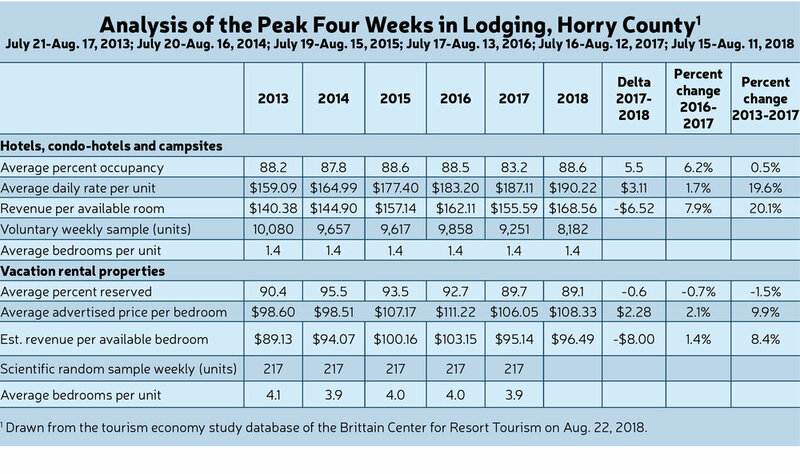 The table below reflects lodging demand during this period across the most recent six years. Average occupancy in the Center’s sample of HC-HCs increased by 5.5 occupancy points or 6.2 percent compared to the equivalent period of 2017. Average daily rate for this sample increased by 1.7 percent, driving revenue per available unit up 7.9 percent. For the VRP lodging segment, 89.1 percent were reserved during the peak rental weeks of 2018, which was down 0.6 occupancy point or 0.7 percent compared with the equivalent period of 2017. Average advertised rental price per bedroom rose 2.1 percent during this period, which would raise average revenue per bedroom 1.4 percent compared with the equivalent period of 2017. There were interesting trends occurring in the lodging industry along the Grand Strand in other periods during 2018, which readers may want to study further. The monthly results of the Center’s nightly rented HC-HC sample can be found in the CVB Insider section (see Page 28). The Center’s most recent weekly CCU Lodging Update, which includes six-week averages for both the VRP segment and the HC-HC segment, is always available at coastal.edu/business/resort, and the most recent 104 editions are available at coastal.edu/business/resort/archives. If you represent a hotel or condo-hotel management company and would like to become a participant in the Brittain Center’s or the Grant Center’s research and receive segment-level results and six-week occupancy forecasts, feel free to contact Taylor Damonte, tdamonte@coastal.edu, or Gary Loftus, gloftus@coastal.edu, at Coastal Carolina University.